Over the years I have acquired 4-5 Sans type chargers for 36v and have a pair set up for 41.2v charging (not balance), every 6- 10 charges I fully balance with a standard 42v charge to ward off an imbalance that may occur. The Sans will charge 10 -12s as it has a voltage adjustment range of 40.7 - 50v and is ideal for 13s/48v storage charge as the 50v = 3.84v. Remove base screws under rubber plugs, use a fine point driver to dig out plugs. The voltage adjustment pot is the little blue trimmer arrowed, it will be covered in a white silicone to prevent trimmer adjustment simply remove it with tip of driver. On the top half drill several holes 8mm -12mm for cooling, doing this stops the charger from getting very hot. Arrowed , correctly align and drill a 8mm hole or thereabouts directly above the trim port for future re -adjustment if you don't dab silicone on the trimmer. The trimmer can be adjusted with an insulated driver for voltage reading adjustment. On both ends drill a pair of 8/10mm holes for through ventilation with all these holes the charger will only get luke to mildly warm. One thing to bear in mind is the accuracy of an ordinary (cheap) multimeter, which is typically (e.g. Roslon) quoted as (+/- 0.5% ) + (+/- 2 digits). This could amount to an inaccuracy of 0.4 volt when reading 42 volts with the 200v scale. To put this another way, a charger reading an output of 42volts could be anything between 41.6v to 42.4 volts. However, in the case of above, one could take the charger reading before adjustment (write it down) and then afterwards, and the multimeter would be accurate enough to verify that one had reduced the charger output by say 1 volt. I have three devices and all are within 0.1v so use that as my base line also the readings agree with my lcd display readings so again quite happy. Also having afew spare cells lying about for torches helps as when fully charged they read 4.19/4.2v. Consensus is charging to 42v damages cells esp if no store voltage is used between use, constantly charging to full then leaving sitting there will shorten cell life. Also there is very little capacity/wh above 41v, a fully charged 42v battery will be at or about 41v after a km or so of use. Setting to 49.5 - 50v is an ideal solution for 13s as a store voltage between charges. if you have a spare charger. I used your tip on drilling holes for ventilation. Works well. I also made a loose fitting sleeve of rubber (removed when charging) to keep out creepy crawlies and dampness, as mine is in my bike shed. I discovered that the power input connection is to a somewhat flexible section of circuit board and too much power cable movement can put strain on the soldered power connections. In my case enough to spark! Luckily a sooty clean up and a resoldered joint cured it. Great thread and great tips! During this weekend I did a little research into how to get the best cycle life from our batteries and I was just thinking "how can I automate this". Well, you provided the solution! * Seems like the best cycle life would be achieved between 20-80% SoC. 80% seems to be ~40V on a 36V battery. You use 41.2V. Is this a compromise you use to get best mileage while getting decent cycle life or will the battery itself never reach 41.2V? Just made the mod myself. Easy peasy my charger output was actually 41.9v before the mod and I can also turn it down below 40v if I want to. Still interested in a good voltage setting for charging in regards to life cycles. 41.2v as @Nealh was using seems high for the 80% I read about everywhere but perhaps I'm missing something? Also wondering, do I need to reach 42.0v to get the bms to balance the cells or is 41.9v just fine? See how the curve drops very quickly after 4.2v? About 4.15v it flattens out so going any lower will extend life somewhat but you will lose too much useful capacity, 4.0v is definitely too low. You will need to know the tech specs of your BMS to know when it starts balancing - many start balancing at 4.1v but without the tech sheet you cannot take that as a given. I have a Yosepower china-celled 13Ah battery so no data on cells nor BMS I'm afraid. Would an indication be where the charger decreases the watts in the charge cycle. Could this be a good point to stop charging? 4.12v is a an arbitrary choice which I use but do carry out a full balance charge every half dozen rides. A little top end capacity is lost but in my view not a lot about <5%. typically when fully charged I see the top end voltage in use disappears very quickly down to about 4.12 and the max higher charge only lasts for about <1km. 80% is practical for longer cell life this is ideal if used for low drain use, with e bikes though an average 15a controller can ask 3a per cell in to assist or on throttle use so too much capacity is lost and 4v is too low if you need the range. Low voltage then may bring in balancing issues if cells are 100% matched. Ok, I'm learning there's a LOT of variables to consider....I'll let go of the 80% charge, otherwise I won't be able to do my commute of 2*12km without recharging twice each day. The charger is set to 40.9V at the moment, seems like a good start. I think you have to find your own balance with charging, depending on your useage. To me, there is no point charging to 80%, then bouncing on the LVC on the way home, as that will likely degrate your pack faster than charging to say 90% and having some reserve power when you have completed your return. You may find as the temp. rises later in the year that 80% comfortably does your 24 km journey. It's only money! Buy a battery and use it till it is done. In the end the km will cost you less than if you are pouring petrol into a moped. Charging at max voltage level isn't very harmful if you are using the bike say with in 6 -12 hrs of charging, the harm is really done when peeps use their bike then fully charge it before putting it a way for a week or four. Leaving it fully charged is like putting a bull in a China shop, in the battery the ions are fighting to release their energy. Use your bike and charge over night them use again, if not using the bike for a day or two or even more leave the battery in its discharged state just ensure the resting V's are in the range of 37 - 39v. Has anyone ever thought of cutting a hole in a charger case and fitting in one of those small LED voltage/% meter's ? They claim high accuracy but who knows, it would at least give you a visual on the state of charge and a guide to when to curtail charging. I just plug a Watt meter inline, it can be used elsewhere when unplugged. Yepp, thought of the exact same thing. I've used a watt meter as well but I'd also like to view the actual voltage to determine when to pull the plug. At the moment (since I'm still learning my battery) I'm meassuring with a multimeter but it's a bit impractical. For me, living in Sweden, the volt meters aren't that cheap when everything comes around since we have this ridicilous fee of ~6£ for every package arriving from outside the EU which means that the nice voltmeter for 1£ will cost 7£ at the end. Estimating SoC by reading the voltage of a charging battery is impractical; measuring the open circuit voltage (OCV) after the battery has rested for a few hours is a better indicator. Beware of the 'rubber band effect', i.e the 'state of charge' often lags behind the voltage. There is a full discussion on this in the link below. The battery needs to be allowed to rest for a few hours before the voltage gives an accurate indication of the state of charge. I have observed this to be the case in practice when testing batteries. This phenomenon is the polar opposite of 'voltage sag' and is directly linked to the internal resistance (IR) of the battery and the charge current. Once the charge is nearing completion and the current is tapering off to zero (constant voltage, or CV stage) the 'rubber band effect' will near zero and the voltage can be reliably used as a state of charge (SOC) indicator. If you want to use pack voltage as a SOC indicator during the CC (constant current) stage of charging, you only need to stop the charge for a matter of seconds, not hours as stated by 'Battery University'. EDIT: I suspect Battery University is conflating two separate phenomenon in the above link, 'inverse voltage sag' and 'surface charge'. The former only requires that the charge current is reduced to zero (stopped) to take a SOC voltage reading. The latter requires that either the battery be left for an hour or so for the surface charge to naturally disperse, or that a brief load is applied to do so at an accelerated rate. 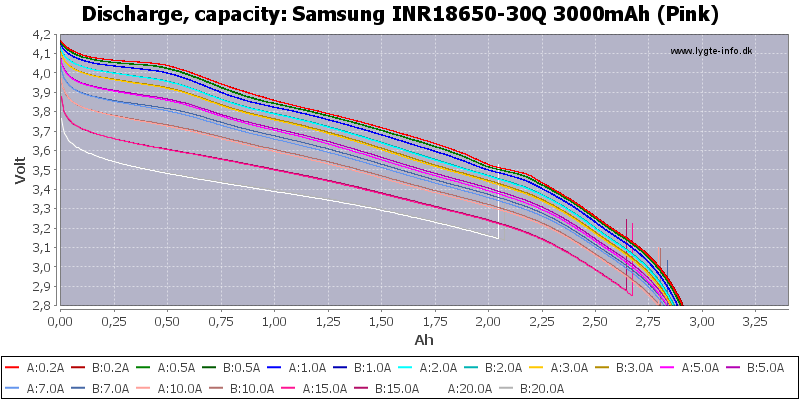 Luckily though, modern lithium battery chemistries do not suffer much from surface charge. You could also compensate for this by testing how much your battery reverts in voltage. For my battery I can take it of the charger at 40.3V and the final voltage will be very near 40.0V which is what I'm aiming for.